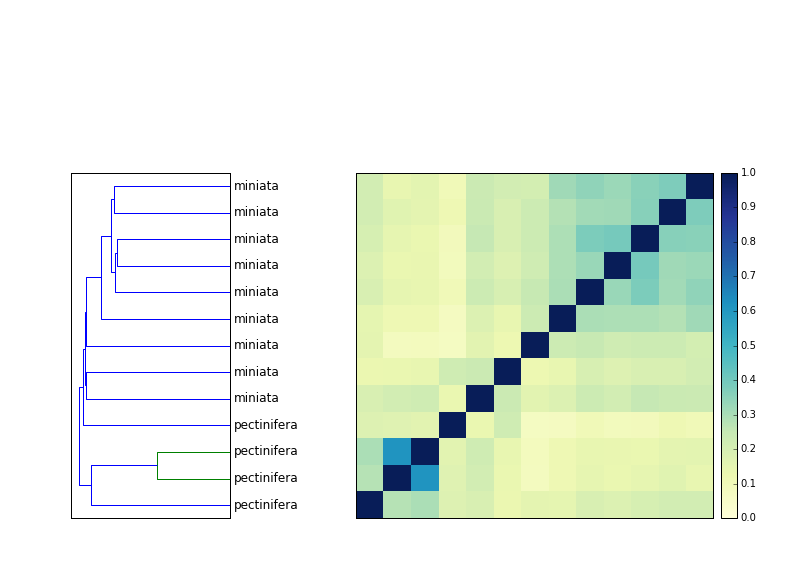 A few weeks back, I had the luck to be asked to review both the mash paper (preprint here) and the MetaPalette paper (preprint here). The mash paper made me learn about MinHash sketches, while the MetaPalette paper made some very nice points about shared k-mers and species identification. After reading, I got to thinking. I wondered to myself, hey, could I use MinHash signatures to cluster unassembled Illumina RNAseq samples? While the mash folk showed that MinHash could be applied to raw reads nicely, I guessed that the greater dynamic range of gene expression would cause problems - mainly because high-abundance transcripts would yield many, many erroneous k-mers. Conveniently, however, my lab has some not-so-secret sauce for dealing with this problem - would it work, here? I thought it might. Combined with all of this, my former grad student, Dr. Qingpeng Zhang (first author on the not-so-secret sauce, above) has some other still-unpublished work showing that the the first ~1m reads of metagenome samples can be used to cluster samples together. 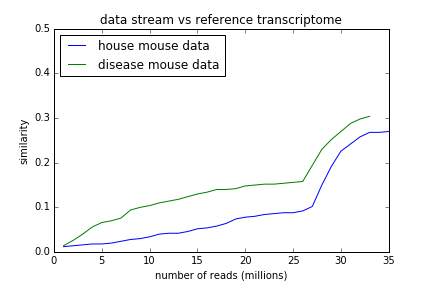 So, I reasoned, perhaps it would work well to stream the first million or so reads from the beginning of RNAseq samples through our error trimming approach, compute a MinHash signature, and then use that signature to identify the species from which the RNAseq was isolated (and perhaps even closely related samples). tl; dr? It seems to work, with some modifications. For everything below, I used a k-mer hash size of 32 and only chose read data sets with reads of length 72 or higher. I implemented MinHash in only a few lines of Python; see the repository at https://github.com/dib-lab/sourmash/. The most relevant code is sourmash_lib.py. Here, I'm using a bottom sketch, and at the moment I'm building some of it on top of khmer, although I will probably remove that requirement soon. How fast is it, and how much memory does it use, and how big are the sketches? 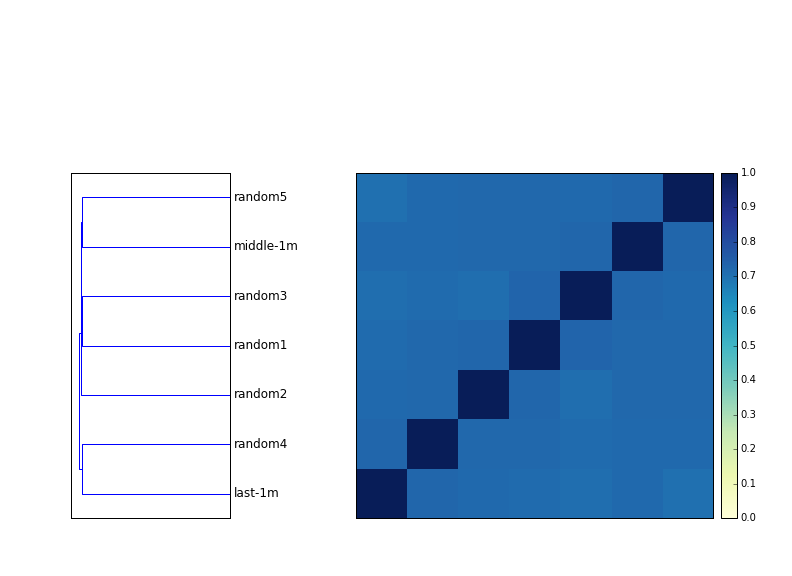 the sketches are tiny - less than a few kb - and the program is dominated by the Python overhead. So it's super fast and super lightweight. Do you need to error trim the reads? The two house mouse samples are replicates, and they always cluster together. However, they are much further apart without trimming. 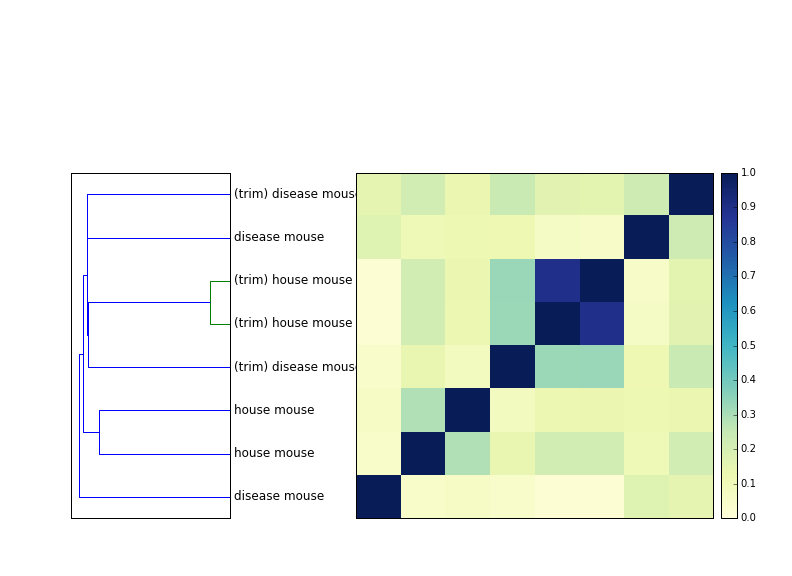 The effect of trimming on the disease mouse samples (which are independent biological samples, I believe) is much less; it rearranges the tree a bit but it's not as convincing as with the trimming. So you seem to get better resolution when you error trim the reads, which is expected. The signal isn't as strong as I thought it'd be, though. Have to think about that; I'm surprised MinHash is that robust to errors! Approximately 1m reads turns out to work equally well for 200 echinoderm (sea urchin and sea star) samples, too. Here, I downloaded all 204 echinoderm HiSeq mRNAseq data sets from SRA, trimmed them as above, and computed the MinHash signatures, and then compared them all to each other. The blocks of similarity are all specific species, and all the species groups cluster properly, and none of them (with one exception) cluster with other species. This is also an impressive demonstration of the speed of MinHash - you can do all 204 samples against each other in about 10 seconds. Most of that time is spent loading my YAML format into memory; the actual comparison takes < 1s! In the urchin clustering above, there's only one "confused" species grouping where one cluster contains more than one species - that's Patiria miniata and Patiria pectinifera, which are both bat stars. I posted this figure on Facebook and noted the grouping, and Dan Rokhsar pointed out that on Wikipedia, Patiria has been identified as a complex of three closely related species in the Pacific. So that's good - it seems like the only group that has cross-species clustering is, indeed, truly multi-species. 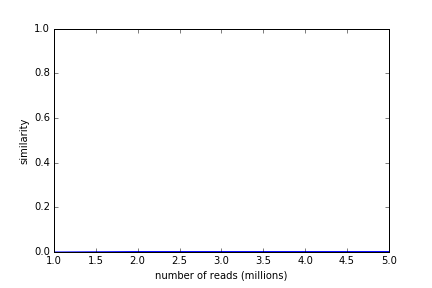 In theory, FASTQ files from shotgun sequencing are perfectly random, so you should be able to pick any 1m reads you want - including the first 1m. In practice, of course, this is not true. How similar are different subsamples? Answer: quite similar. 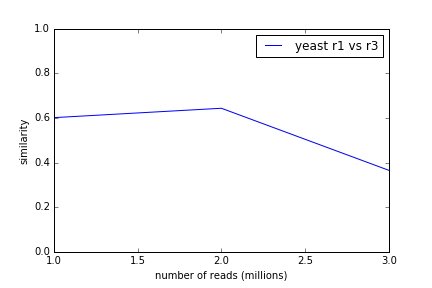 All seven 1m read subsamples (5 random, one from the middle, one from the end) are above 70% in similarity. If you look at (say) yeast and mouse, there's simply no similarity there at all. 32-mer signatures are apparently very specific. What happens when you look at more than 1m reads? Do the streams get more or less similar? 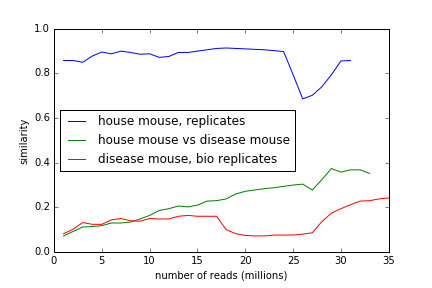 If you walk through two streams and update the MinHash signature regularly, you see either constant similarity or a general increase in similarity; in the mouse replicates, it's constant and high, and between disease mouse and house mouse, it grows as you step through the stream. Yeast replicates also maintain high similarity through the data stream. The next question is, what are we actually seeing signatures of? 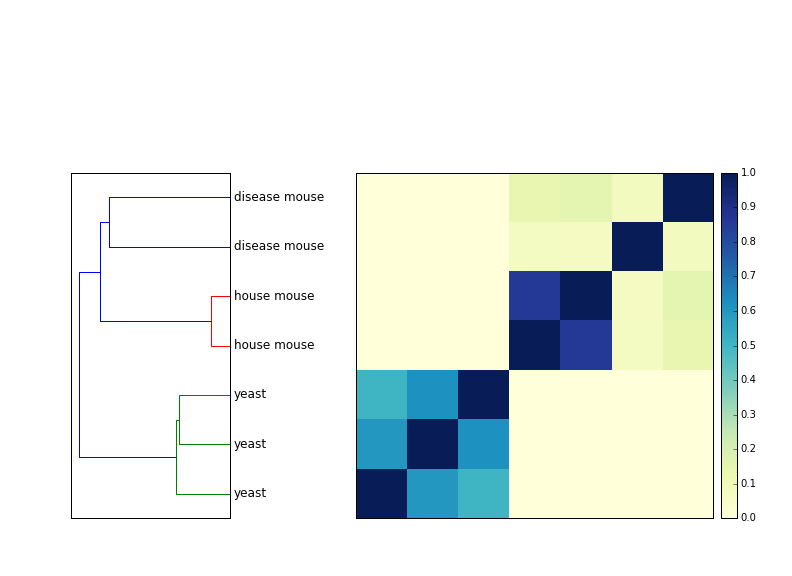 For example, in the above mouse example, we see growing similarity between two mouse data sets as we step through the data stream. Is this because we're counting more sequencing artifacts as we look at more data, or is this because we're seeing true signal? So, it seems like part of what's happening here is that we are looking at the True Signature of the mouse transcriptome. Good to know. And that's it for today, folks. So, it all seems to work pretty well - the mash folk are dead-on right, and this is a pretty awesome and simple way to look at sequences. Right now, my approach above seems like it's most useful for identifying what species some RNAseq is from. If we can do that, then we can start thinking about other uses. If we can't do that pretty robustly, then that's a problem ;). So that's where I started. It might be fun to run against portions of the SRA to identify mislabeled samples. Once we have the SRA digested, we can make that available to people who are looking for more samples from their species of interest; whether this is useful will depend. I'm guessing that it's not immediately useful, since the SRA species identification seem pretty decent. One simple idea is to simply run this on each new sample you get back from a sequencing facility. "Hey, this looks like Drosophila. ...did you intend to sequence Drosophila?" It won't work for identifying low-lying contamination that well, but it could identify mis-labeled samples pretty quickly. Tracy Teal suggested that this could be used in-house in large labs to find out if others in the lab have samples of interest to you. Hmm. More on that idea later. Do samples actually cluster by expression similarity? Maybe - more work needed. 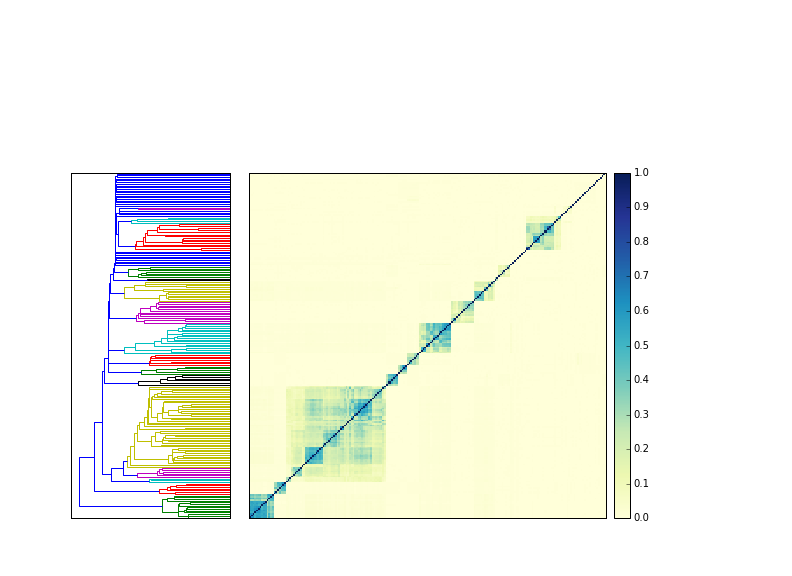 Can this be used to compare different metagenomes using raw reads? No, probably not very well. At least, the metagenomes I care about are too diverse; you will probably need a different strategy. I'm thinking about it. I pretty much reimplemented parts of mash; there's nothing particularly novel here, other than exploring it in my own code on public data :). So, thanks, mash authors!